Well, this was one of the major problem of many those wanted to put ads on Facebook but they could not because you don't have much options for payment for putting ads on Facebook in India but now recently I have seen there is an option come out and that is payment through internet banking, I hope this is one of the amazing opportunity for all those unable to put ads on Facebook only because of payment options barrier. Because there are only few percent people those have credit card in India, & reason behind this is getting credit card required certain things, well in this blog post I am going to share with you pretty cool things, actually recently I am experimenting with affiliate marketing much to find out the best, even I opened door for all to earn money online. Wait, I will share with you more about it; that how you can earn up to 60% commission and I will tell you step by step guide and guess what it would be completely free of cost and that's really huge for all of readers, I will give all these as gift so stay tunes and keep blogging for doing and getting best out of it. Here, I am going to share with you step by step, what I did with Facebook ads? Actually I wanted to test the whole things in order to find out something new, well before going to tell you all things let me tell you one thing; its all fun and learnt great lesson and also learn few new things. Here, was my goal, well did not spend even $1 for the campaign and really its amazing and got 55 likes for that blog posts shared on Facebook and of course 154 reach and that's great. Actually the statistics you are seeing its for one of my campaign which is the newest one, in upcoming days I will write more because I am going to take more actions and means more things I will have to share with you. 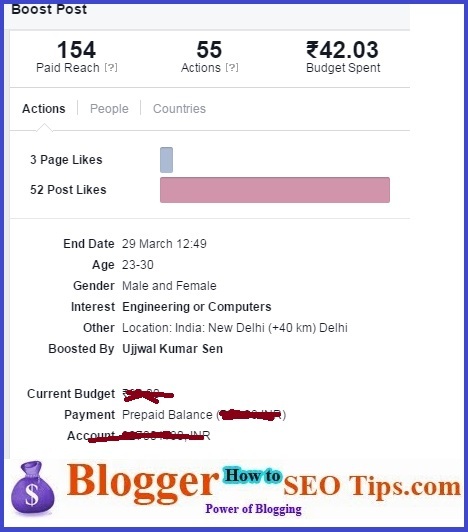 Whenever you will post anything on your Facebook page there you will see option that is boost post, just click there then you will be redirect to the Facebook ads page and then you will see several options like targeting people, location you want to target, gender you want to target and of course your budget and at the last payment option. Choose "People you choose through targeting"
Now after payment I wait for the approval and suddenly I got mail from Facebook that my Ads has been approved and there I got result. Here, I am going to share with you, what I have learn from this campaign, see I think as a blogger you need to do experiments that's why you can share real stories with your readers like this one but don't invest lot of money, try from small budget if it is giving you back then go for bigger one and you know scaling online business is really easy, simple and amazing. Well, many of you may be don't want to invest money, believe me dear if you will not invest money in your business then your growth level will be slow, just like the same in physical business suppose that you have opened a coaching centre, if you will not promote it and you will not hire class teacher then you can not grab the attention of market. So, investment required, that is why I am sharing with you all these things but you required good people to do all these staff if you are not good in this field, if you need help I can help you. What do you think about putting ads on Facebook? No Right now there are only two ways for payment for putting ads on Facebook, one is internet banking and another one is credit card. Simply amazing tutorial. I was looking for facebook payment tutorial and your post solves all my questions. Thank you for sharing your knowlege. Welcome to my blogging world.